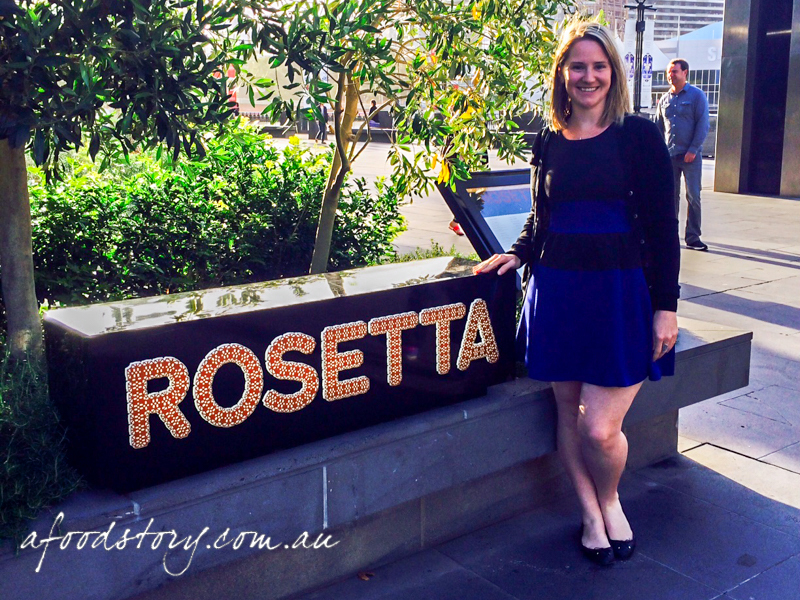 Rosetta is the only Rockpool Group restaurant that we were yet to dine at – and that is only because it happens to be interstate. But for New Year’s Eve we decided to do things a little different and celebrate down in Melbourne. To make it more ‘fun’ we decided it would have to be a road trip. Our convoy (2 cars is a convoy, right?) set off in the wee hours of Tuesday morning so we had time to get to our hotel, freshen up and head out on the town. When planning ahead, as Lex & I tend to do, a booking for dinner was a must. We had to ensure the restaurant would be open and able to accommodate a large group too. Rosetta just happened to tick all of these boxes so we booked it in as it seemed a great way to finish off the day after a 10 hour drive. Although we had heard mixed reviews about the place we were still keen to go and try it for ourselves. Spaghetti – Pipies with white wine, chilli and garlic ($35.00). When it came to the menu it seemed we had a diverse group, Lex & I were the only ones to be considering pasta & a main as everyone else was being sensible with thoughts of entrées and pasta, or shared anitpasti and pastas. 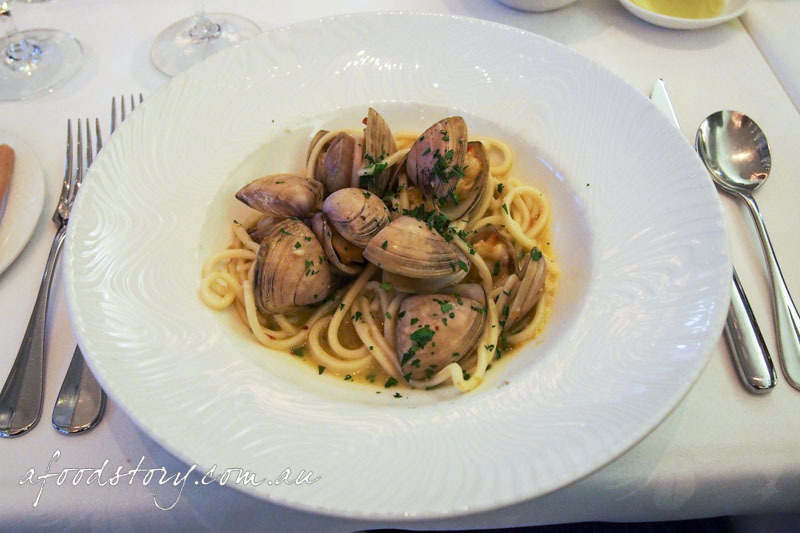 Once I had decided I wanted pasta to start I began to whittle down the list of candidates before settling on the spaghetti with pipies, mostly because as of late seafood pastas have just been spot on for me. I took the first pipi out of its shell and gave it a try, it was sweet and salty, a great little gem. Working quickly I popped them all out of their shells to get them in the sauce and pasta. There was quite a body to the emulsion and it clung to the spaghetti well, the pasta itself was cooked al dente as it should be. It was a great combo, a very slight hint of chilli and a good amount of acid from the white wine melded well with the pipies. My only issue was by the end of the dish the level of salt felt a bit too much. Tagliarini Neri – with warm spanner crab, fresh chilli and lemon ($35.00). Following suit Lex also started with a pasta, and just like me it was a process of elimination that was employed to come to a final choice of squid ink tagliarini. 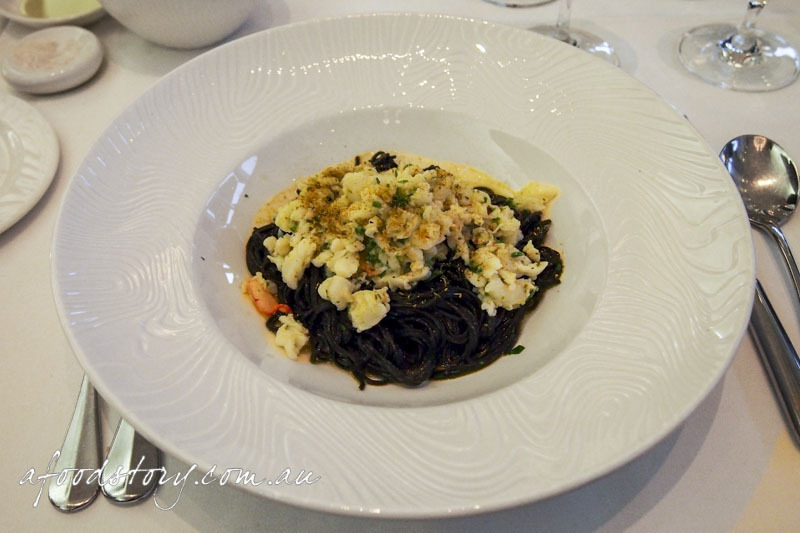 When it came to looks I had food envy right away, a generous pile of creamy white spanner crab sitting on top of black pasta made for a visually stunning dish. Even more impressive than presentation the flavour just wowed us both. The lemon helped accentuate the delicate sweetness of the stunning crab and the chilli paired ever so well with the clean salty squid ink in the pasta to make this dish a real winner and quite easily the dish of the night. 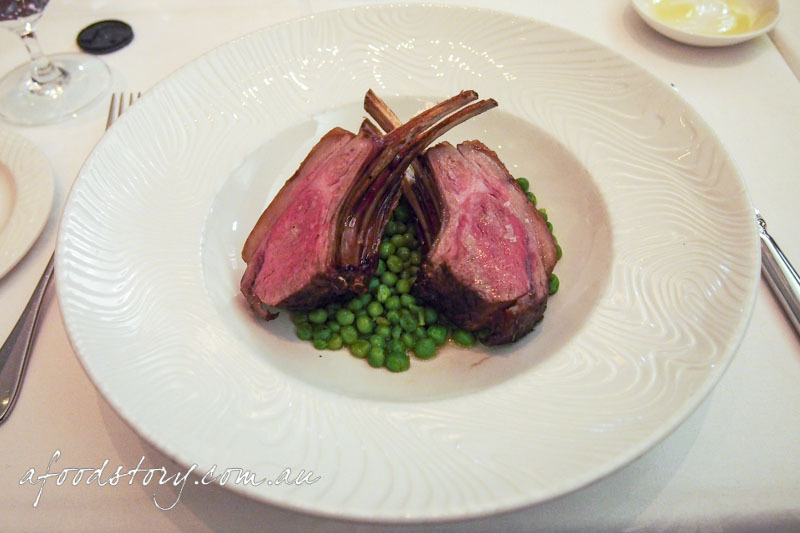 Agnello – Hay baked lamb rack with braised peas and prosciutto ($49.00). For a change I decided I should skip the steak option and go for something different and it was the lamb rack that really stood out as a suitable replacement for my beloved beef. When it arrived a smile came across my face as I took stock of how awesome it looked. Quite a generous portion and impeccably cooked, the lamb was so soft and succulent and there was only the faintest hint of the hay it had been baked in. Continuing on with the good flavours was the superb combo of peas and prosciutto, sweet freshness from peas and salty richness from prosciutto. 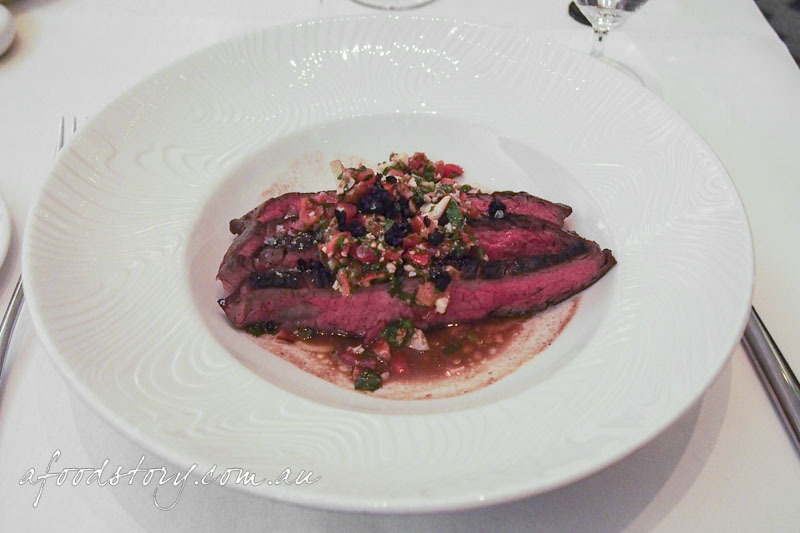 Tagliata di Manzo – Charcoal grilled Rangers Valley flank steak with pesto trapanese ($42.00). With the idea of sharing our mains Lex was generous enough to order the flank steak so I wouldn’t have to miss out on my beef hit. The steak itself was spot on, a great amount of char and cooked to a blushing medium rare, there was a bit of extra bite from being flank but that is to be expected and something I rather enjoy. For me the trapanese was great, it was full of real big hitters, olives, garlic, basil and balsamic vinegar, but for Lex the sheer amount of balsamic swamped everything and became the one thing that took over. Because she was unable to finish it I took it upon myself to, and even for me the sauce became too much to handle by the end. 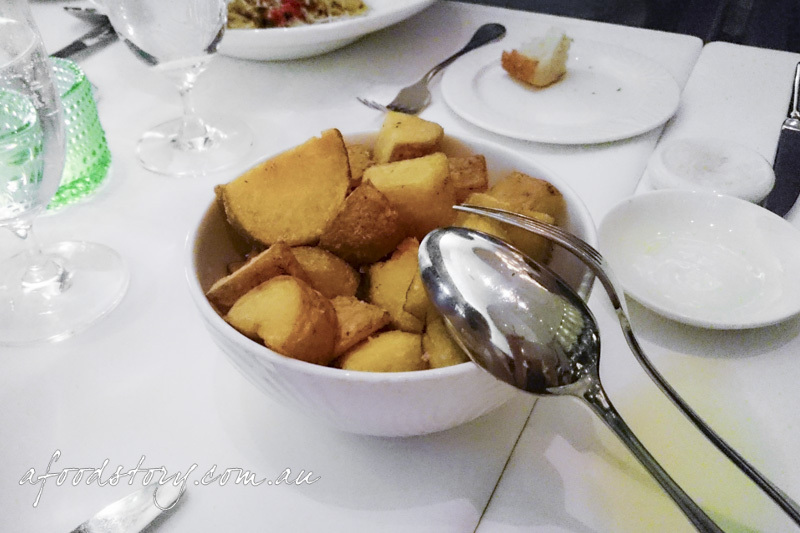 Patate – Crispy potatoes with rosemary salt ($10.00). Somehow we were convinced by our waiter to order sides. We were reluctant but had our arms twisted enough to settle on roast potatoes, but not just one serve, two! Definitely bonus point to our waiter in getting the sides in there, and by the time they arrived we knew they were never going to be finished. Large portions and a great little number to plonk on your plate to drink up leftover juices. As expected they were crisp and fluffy but there were just far too many for even the group of seven to finish. 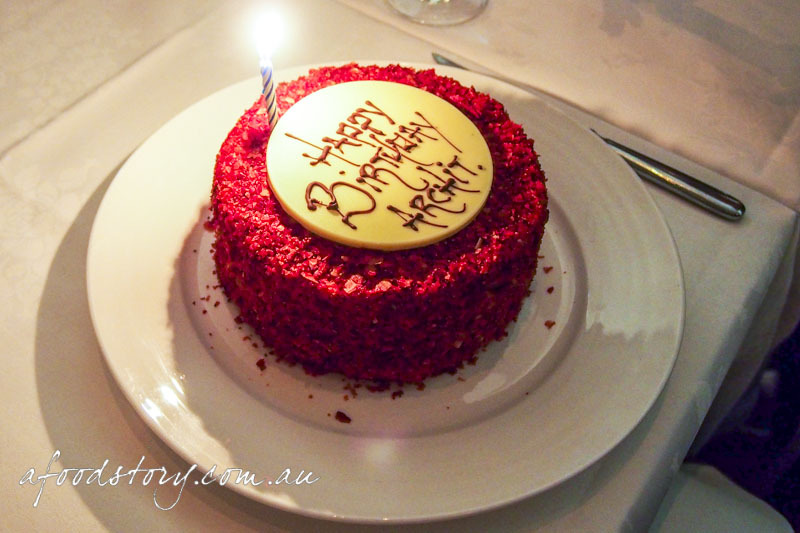 Medium Strawberry Mascarpone Cake ($90.00). Little did most of the group know there had been some secret squirrel business going on and as it was Archit’s birthday a cake had been organised. It wasn’t just any cake but Catherine Adams’ ever impressive Strawberry Mascarpone Cake! Presented to Archit with candle flickering away and a massive white disk with chocolate writing. He was suitably surprised with this number. After being divvied up (by the kitchen) I got stuck into my sizeable portion and was met with a cake that became an instant favourite. Layers of ultra soft cake, super creamy and slightly tart mascarpone and slices of fresh strawberry made up the middle with flakes of dehydrated strawberry coating the outer. I just loved every little bit of it. We feel we made a rookie mistake with our mains, it would have been a much better idea to start our order with some antipasti, followed by main sized pastas and finish with dessert but it was our own fault for not thinking it through. A few in the group felt the main sized pastas were the same size as the entrée versions which never leaves a good impression – and nobody wants to feel like they are being short changed when the prices are up there. Food aside the service was faultless, attentive and knowledgeable, easily the best part of the restaurant and it was able to make up for the odd miss here and there with the food. It may just be a rumour but I think you can get it in Sydney’s Spice Temple and Rockpool Bar & Grill. Also, Happy Birthday Arch, making for the most belated bday wishes ever! It’s almost Arch’s birthday again 😉 Happy Birthday Arch!!! That cake was delicious!! !